..... Click the link for more information. between moving parts or to support moving loads. There are two main kinds of bearings: the antifriction type, such as the roller bearing and the ball bearing, operating on the principle of rolling friction; and the plain, or sliding, type, such as the journal bearing and the thrust bearing, employing the principle of sliding friction. Roller bearings are either cylindrical or tapered (conical), depending upon the application; they overcome frictional resistance by a rolling contact and are suited to large, heavy assemblies. Ball bearings are usually found in light precision machinery where high speeds are maintained, friction being reduced by the rolling action of the hard steel balls. In both types the balls or rollers are caged in an angular grooved track, called a race, and the bearings are held in place by a frame, commonly called a pillow block or plummer block. Ball bearings or roller bearings reduce friction more than sliding bearings do. Other advantages of antifriction bearings include ability to operate at high speeds and easy lubrication. ..... Click the link for more information. ). Bearings that are not split are called bushings. in navigation, the angle between the meridian plane of the observer and the vertical plane passing through the point of observation and the observed object. 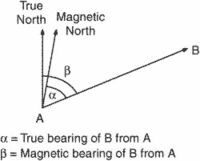 The bearing angle is the same as the azimuth. Bearings are designated as true, magnetic, or compass bearings, depending on the type of meridian from which they are reckoned. There are several systems for taking bearings. In the circular method, lines of position are stated in degrees clockwise from the northerly meridian. In the semicircular method, lines of position can be read clockwise in degrees from the northerly and southerly meridians. The quadrant method states lines of position in terms of quadrants; that is, the bearing angle is read with respect to the northerly and southerly meridian clockwise and counterclockwise between the limits of 0° and 90°. The rhumb method is also used, in which bearings are taken by dividing the circle of the compass into 32 rhumbs and reading from the northerly meridian. a shaft or axle support that fixes the position of a rotating or rocking part of a mechanism relative to the other parts. Bearings are classified according to the direction of loading as radial, taking loads perpendicular to the axis of the shaft; thrust, taking loads directed along the axis of the shaft; and radial-thrust, taking composite loads, mostly radial (thrust-radial bearings, taking mainly axial loads, are used less frequently). Bearings are also distinguished according to the type of friction as rolling-contact (the more common) and plain types. That portion of a beam, truss, or other structural member which rests on the supports. A machine part that supports another part which rotates, slides, or oscillates in or on it. 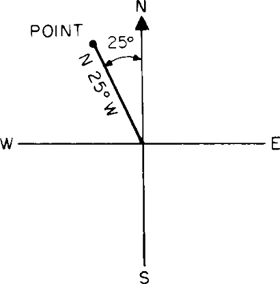 The direction of a mine drivage, usually given in terms of the horizontal angle turned off a datum direction, such as the true north and south line. The horizontal direction from one terrestrial point to another; basically synonymous with azimuth. 2. That portion of a beam, truss, or other structural member which rests on the supports. 3. The support for a shaft, axle, or trunnion. 4. In surveying, the horizontal angle between a line and a reference meridian adjacent to the quadrant in which the line lies. i. The horizontal angle at a given point measured clock-wise from a specific reference datum to a second point. The bearing can be true, magnetic, relative, or grid, depending on the selected datum. ii. A surface that supports and reduces friction between two moving points. Located in Troy, NY, Pacamor Kubar Bearings is one of the last American owned and operated miniature and instrument ball bearing manufacturers. Proper lubrication is essential to successful bearing performance in demanding applications and PKB uses only high quality, filtered lubricants in its antifriction bearings. A business located in Troy, NY, Pacamor Kubar Bearings is one of the last American owned and operated miniature and instrument ball bearing manufacturers. initially expressed its interest in taking General Bearing private through a tender offer at $3. General Bearing manufactures ball bearings, tapered roller bearings, spherical roller bearings, and cylindrical roller bearings, and bearing components. A specialized bearing that provides stability for military aircraft and high-speed trains like the TGV requires precision design," said Simon Booker, SolidWorks sales and marketing director for the U. The SatCon magnetic bearing system suspended the turbine shaft at both ends of the radial axis, and along the longitudinal, or "thrust" axis. com/reports/c34923) has announced the addition of UK Bearings Market Research Report to their offering.